இதல் – காடை – Quail (see also சிவல்). 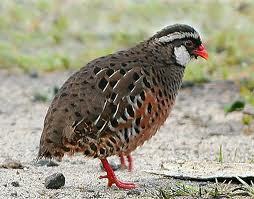 சிவல் is கவுதாரி (partridge). These two birds are very closely related. This could be a Painted Bush Quail – Perdicula erythrorhyncha . According to Dr. Salim Ali’s book ‘The Book of Indian Birds’, this is the only quail with red beak and red legs, and the habitat includes Tamil Nadu and Kerala.